Also we have updated our newsletter system for your convenience. Please let us know what you think of the new format. We hope you enjoy the newsletter, and we look forward to hearing from you. If you have trouble viewing this newsletter in your email browser, please click here to see it online. 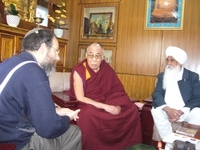 On a recent visit to India, Dr. Alon Goshen-Gottstein, met with His Holiness the Dalai Lama, together with Bhai Sahib Mohinder Singh and an entourage of Sikh delegates (pictured at left), who will be co-hosting the next meeting of Elijah’s Board of World Religious Leaders, this coming November, in Amritsar, India. The Dalai Lama has agreed to hold the second part of the meeting at his residence in Dharamsala. The specific focus upon love and forgiveness will allow the Dalai Lama to share his reflections upon the meaning of love and forgiveness in light of the Tibetan experience of the 20th century. The inspiring three-way exchange between them led to a variety of reflections from the perspectives of Buddhism, Sikhism and Judaism. Some highlights are shared below in the Sharing Reflections section. The November meeting of the Elijah Board of World Religious Leaders will take place in collaboration with Guru Nanak Dev University in Amritsar. In conversation with university vice chancellor and with Dr. Bollant Singh, director of the department of Sikh studies, the need for a Jewish-Sikh scholars’ dialogue came up. Such dialogue is also a natural growth from the Sikh pilgrimage to the Holy Land, co-hosted by Elijah in 2005. The two religious communities have many similarities, in faith, in social composition and in terms of their size and global presence. A scholar’s forum, bringing together scholars of both religions, would meet alternately in Jerusalem and in Amritsar. Planning for such a forum would begin in 2008. On a recent visit to Morocco, Elijah director met with the director of ISESCO, Dr. Abdulaziz al-Twaijiri. 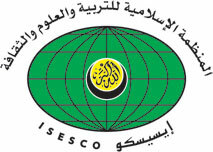 ISESCO is the Islamic Educational, Scientific and Cultural Organization, set up by member states of the Organization of the Islamic Conference. This complements the UNESCO Chair status that Elijah has enjoyed since 1999. Partnership with ISESCO will provide the opportunity for ongoing programming collaboration with ISESCO, on projects such as the Muslim Theology of World Religions project, whose first large plenary meeting will take place in Ifrane, Morocco, this coming May. Recognition as ISESCO partners will enhance Elijah’s credibility with further Muslim partners and organizations, enabling Elijah to be even more effective in its work with Muslim theologians and thinkers. Rabbi Alon asked the Dalai Lama what lessons had been drawn from the Dalai Lama’s meetings with Jewish thinkers and leaders, several years earlier. The Dalai Lama: On several occasions I had pointed to the Jewish community and to how they survived in different communities, even under difficult circumstances. They kept their spirit and traditions. When we became refugees, our concern was how to preserve our tradition, Buddhist culture. We often mentioned that we must learn from the Jewish community’s experience, keeping their spirit and traditions through generations. Eventually we noticed that their main method for preservation of tradition and culture was not in Temple, like Hindus and Buddhists, who concentrate in monasteries, but in the family. The individual family carries the tradition. So even children happily participate. Mohinder Singh shared his impressions from the Sikh pilgrimage to Israel. He recalled the celebration of the Sabbath at Rabbi Alon’s home. The Sabbath, on a weekly basis, provides a connection between fathers and children, thereby maintaining the culture. In many religions, he said, parents don’t meet enough with their children. The other lesson he learned from his pilgrimage was how the elders sit with the young ones and look at the Torah. The Dalai Lama: Since some time back I am telling Tibetan and Chinese Buddhists that now we are in the 21st Century and therefore we should be 21st century Buddhists. We should have full knowledge about Buddhism. It is not enough to cite just a few verses. We must pay more attention to study. For the past forty years we have made efforts to promote a high standard of study, not only in monasteries, but also in nunneries. Now the time has come to promote Buddhist understanding in the life of lay people of the community, so that father and mother will be learned people who can teach in their own home. Mohinder Singh: The first teacher is the mother. Whatever the mother thinks affects the child. Education must start in the home. Family life is the basis. The Dalai Lama: I also believe and tell people that our real teacher of compassion is our mother. Not our Guru. He comes later. It is the Mother who waters us with compassion and that way we grow. Mohinder Singh: In the Sikh tradition, the mother was exalted next to God. They said that God made mother because he could not be everywhere. The Dalai Lama: (laughing) Wonderful, very good.